This is a review of My Next Guest needs no introduction with David Letterman on Netflix. Let’s deal with the things that are still the same. The trousers are still too short, although the socks don’t seem to be white anymore. That’s it. Everything else is different. A new set, no band, no desk, no pencils, no gimmicks. The beard. Letterman is back. In a new Netflix series, the former Late Show host takes a more thoughtful, deliberate approach to the chat show by inviting just one guest per week to appear. In the first episode, the guest is a big one. The rush of applause when David Letterman announces the “44th President of the United States, Barack Obama”, is astounding. There is a suggestion that most of the audience doesn’t know who the guest is before the announcement, which is a nice touch, and after a short intro the two sit facing each other and start to catch up like old friends. Both Obama and Letterman share the recent experience of being out of work, but it’s clear that the former President has enjoyed his time off. He has profited from an extended break with his family, before getting down to the serious business of being an elder statesman. He talks at length about his childhood, the civil rights movement that inspired him to be involved in politics and more. Cut into the interview are some short film segments, which were enjoyable and informative and showed a side of Letterman I like and added some context to the discussion. Obama and Letterman largely skip mentioning the current President by name, but during the filmed segments with Congressman John Lewis, there is some more direct commentary on the current administration. I like this new format for David Letterman, the Late Night format of jokes, skits and short interviews is OK – but it’s really good to see a more ‘long form’ interview with someone that can pull decent guests who are prepared to speak in depth. There are six episodes in this new season, over the next months we’ll see George Clooney, Malala Yousafzai, Jay-Z, Tina Fey, and Howard Stern follow Obama onto the stage. Overall. This Episode. 10/10. Netflix. From the creator of Luther, Hard Sun is a BBC drama over six episodes which are all available as a box-set on the BBC iPlayer site. This time, it’s the apocalypse which looms over the characters who are tackling gruesome and inventive murderers and spree-killers. Each of the key protagonists is fighting their own demons, with the stories interweaving with the grand conspiracy theory around the impending Hard Sun. From episode one, the paranoia is cranked up high. Elaine Renko (Agness Deyn) is involved in a vicious fight with a brutal ending before the credits roll. The other main character Charlie Hicks (Jim Sturgess) has his own suitably gritty back story which unfolds over the season. As these unlikely and uncomfortable detectives work together, they face into the secret service, headed by the brilliantly dark and detached Nikki Amuka-Bird as Grace Morrigan from MI5. Morrigan is both delicate and brutal at the same time, with the most menacing quiet voice I’ve heard for quite some time. As the episodes unfold, the impending rumours of some apocalyptic future fuel some quasi-religious and cultish crimes for the duo to solve, whilst managing their personal issues and the secret services bearing down on them. I enjoyed Hard Sun, in places, it was a touch overacted but the stories clipped along at a good pace and the direction generated some suspenseful scenes. The casting was good, especially Nikki Amuka-Bird who was thoroughly nasty – even a final episode where we see her humanity has moments of real menace. There is a comparison with other dystopic views of the near future, and Hard Sun stands up well against others like Black Mirror. I’d recommend Hard Sun as a good binge watch. The BBC do this stuff really well, and this is no exception. At the very least it will tide us over until Luther comes back. 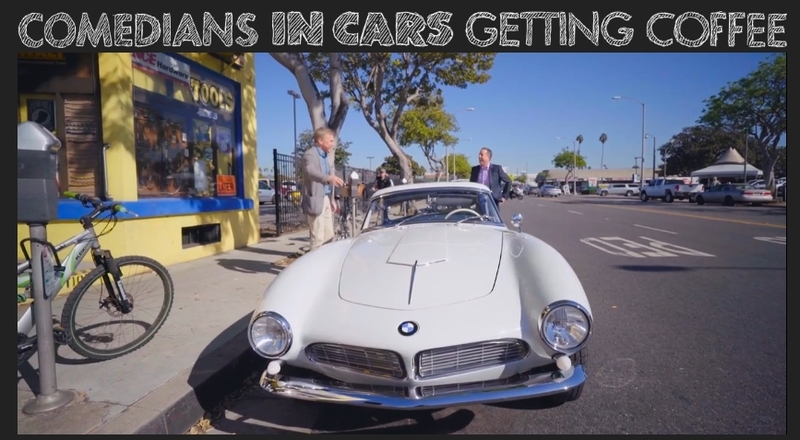 I’m late to a party here, but I only discovered Comedians in cars getting coffee on Netflix last week and binge-watched much of the first season at the weekend. The premise is simple, Jerry Seinfeld introduces us to a different classic car each week, some of them are stunning. We get a few facts about the car, which highlight what a petrolhead Seinfeld is. Things then get interesting, Jerry ‘calls’ a friend, picks them up and they nip off for a coffee and some lunch/brunch. It’s a chat show, in a car, with a coffee – or something. So far, we’ve seen Jim Carrey, Ricky Gervais, Chris Rock, Tina Fey and a host of others. My complete favourite was Christoph Waltz who seemed utterly entranced by the vintage BMW coupe and equally bemused by the International House of Pancakes. You eat want you want… Don’t worry, we can fix it with medicine. The episode with Ricky Gervais (above) was also very funny, with Seinfeld driving around New York in an Austin Healy 3000 and scaring the daylights out of Gervais. Each of these shows is about 20 mins long, so you can easily much through a few in an hour with a coffee – well worth watching. My only criticism is that it’s light on women, I think in the 50/60 episodes listed, I could see less than 10 or 12 women. They need to do a better job of booking some of the very funny women in comedy. New Years Day, sofa coma. Netflix. Reviewers have panned it, but I’ll make up my own mind, alongside 11 million Netflix viewers. The new Will Smith project, Bright is set in a future where magic has entered the world. Orcs, elves and fairies live alongside humans, and in the case of the LAPD, an orc is partnered with Will Smiths tough cop. Magic ensues – with Smith and his Orc partner, played by Joel Edgerton battle various other-worldly entities for control of a powerful tool. The action scenes are excellent, and the Fresh Prince carries his typical script very well, but it was a little bit far-fetched for me. Reasonable sofa coma entertainment. 5/10. IMDb. The twixtmas gap allowed me to binge watch the latest season of Black Mirror (Netflix), giving me another chance to look into the dystopian vision of Charlie Brooker. Once again, some entertaining and thought-provoking episodes. I specifically liked ‘Hang the DJ’, with its terrifying look at dating and relationships, controlled by algorithms. I also loved the ‘rise of the robots’ view of Metalheads starring the always amazing Maxine Peake. The only episode I didn’t completely love was ‘USS Callister’, which seemed to go down the well-trodden path of ‘technology in the wrong hands’, which left me a bit non-plussed. Overall though – excellent stuff. 9/10. IMDb. Netflix.